Donor organizations and nonprofits collaborating on social investments use True Impact to easily generate Impact Receipts® (our version of grant reports), even among novice users. All stakeholders - donors, intermediaries, and nonprofits/NGOs - use the same universal report for social investments. The Impact Receipt contains all the data you need, and none of the data you don't. True Impact staff evaluate donor’s existing portfolio of investments, develop draft indicators, and then work with them to revise them into consensus final form. Send True Impact invitations to prospective grantees as part of your application process. The nonprofits generate prospective Impact Receipts by forecasting expected impacts, facilitating investment decisions. Once the contribution is approved, the donor monitors how actual results compare to initial forecasts during program implementation, as the nonprofit updates the report. 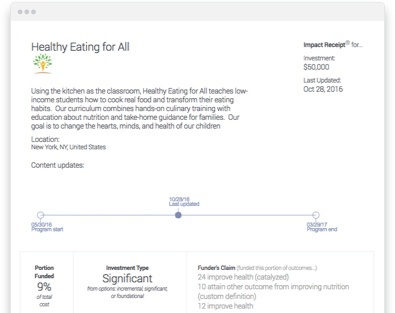 Use True Impact’s simple interface to summarize the core elements of your program or initiative, and forecast your expected outcomes over your upcoming funding term. Enter each of your donor’s investments of cash or in-kind goods/services (as either a request or already approved donation) and apply it to the relevant program reports. This will automatically generate an Impact Receipt (grant report) for the donor. Over the course of the program’s funding term, update the content of your report as appropriate (either with updated forecasts or final results). Donors’ Impact Receipts will automatically update with this new information. Participate in True Impact’s evolving activities around best practice identification and resource sharing among nonprofits with similar social focus areas. For federated networks or other nonprofit consortia, True Impact “Headquarter Accounts” can be used to link individual nonprofit accounts so to facilitate benchmarking or aggregate reporting. For organizations that facilitate philanthropic activities -- such as grant management or volunteer management systems or portals, donor advised funds, or technical assistance and program management providers -- True Impact provides a powerful, turnkey impact reporting solution to enhance philanthropic intermediary services. True Impact’s flexible integration options -- either through simple link sharing, embedded iFrames, or full data exchange through our comprehensive application program interface (API) layer -- we can supercharge your current software solution. As donors invest money, time, or in-kind goods or services through facilitated grants, volunteerism, or other social investments, True Impact automatically generates an Impact Receipt®, calculating how much social impact the donor can claim as a result of their investment. Drive continuous improvement by identifying and sharing best practices among your facilitated activities.